Integrate your LinkedIn account with Rank Ranger for enhanced LinkedIn Analytics reports that can be viewed in our marketing platform, white label client dashboards and automatically sent in white label PDF format to your clients and managers. You must be a LinkedIn Company Page Admin and logged into your LinkedIn account in another tab / window prior to connecting the account to Rank Ranger. LinkedIn connections are valid for two months and need to be renewed. We send automated emails 14 days before the connection is expected to expire, with a link directly to the Authorized Connection page where you can click a Renew button to prevent expiration and ensure reports contain the data you expect. You must be a Designated Page Admin in order to authorize LinkedIn data integration. Confirm this authorization: when viewing the LinkedIn Company page you should see an Edit option in the upper right of the screen. 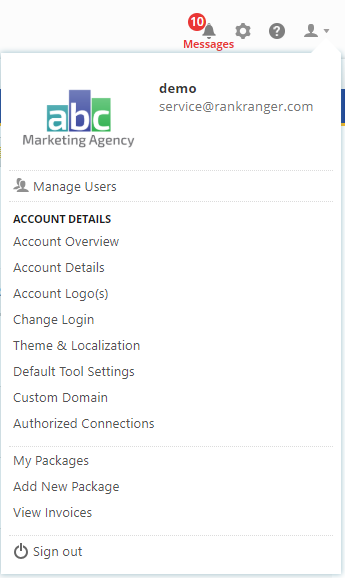 If you do not see the Edit option then you will need to ask the page owner to make you a Page Admin or authorize the Rank Ranger connection for you. In order to provide you with LinkedIn Analytics reports and tools, Rank Ranger requires your authorization to access your profile overview (name, photo, headline and current positions), email address, shares, comments, likes and company pages for display in your social analytics reports in our marketing platform. You can add as many LinkedIn accounts to Rank Ranger as you'd like, so we recommend that you name each connection for easy identification when connecting to rank tracking campaigns. After authorizing integration of your LinkedIn account to our app, you need to connect a LinkedIn profile with a rank tracking campaign. In the Select Connection Name for LinkedIn field, click the down arrow and select the appropriate account. If your LinkedIn account has access to more than 1 business page, select the page that corresponds to the campaign. When the connection is successful, you will see the LinkedIn account avatar and name (if you don't then you need to click the Connect button). To switch to a different LinkedIn account, click the Disconnect link and repeat the campaign connection. Click the View Report link to launch the LinkedIn Analytics Dashboard. When available, you'll find additional LinkedIn reports and tools in the left sidebar of the Reports > Social Analytics screen.